In October last year, it was reported that an anti-drone ‘death ray’ had been developed that could knock a UAV out of the sky from up to a mile away. And in December, Tokyo police department revealed a drone that could capture other UAVs by literally scooping them up in a giant net. But now, the battle against rogue drones has moved up a gear, as Dutch police have revealed they are training eagles, one of nature’s greatest predators, to intercept drones during an emergency. Using these birds of prey to capture drones is part of a new trial by the Dutch police in collaboration with Danish raptor training firm Guard from Above. 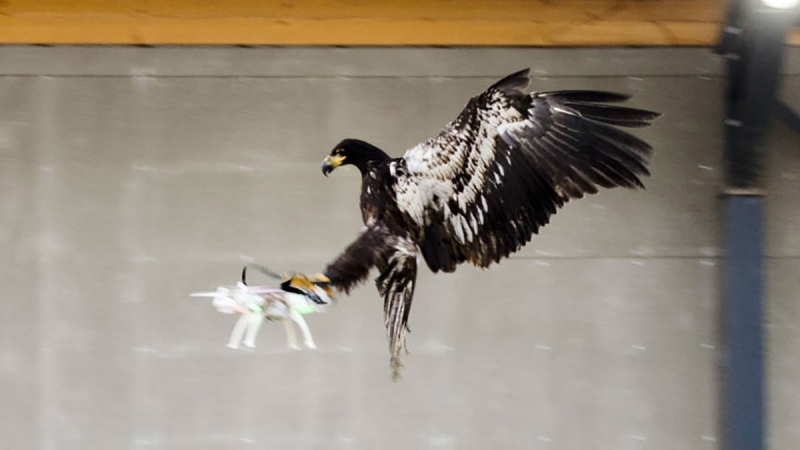 Once an eagle is trained to recognize a drone, it can then grab one from the sky and carry it to safety. The handlers then trade the drone for treat to reward the eagle. Drone-killing eagles is just one solution the police force is testing against illegal UAV activity. They are also trialing a variety of other physical and electronic methods, including using a net, but the biggest advantage the birds have is that they can carry a drone away from a crowd, meaning there’s little risk of an incapacitated UAV falling and injuring someone below. Of course, the big danger for this anti-drone flying army is that, despite having incredibly sharp talons and a grip that can crush bone, the eagles do risk being injured by the fast-spinning propellors on the devices. In the video, however, one of the handlers says that the scales on the eagles' legs protect them from harm, but adds that some form of extra protection may be created for the birds at a later stage. So if you’re visiting Holland in the near future and notice a drone buzzing around somewhere it shouldn’t be, don’t be surprised to see a massive, armored eagle swoop out of the sky and grab it like an unsuspecting flying rodent. If you want to see the birds in action, check out the (Dutch-language) video below.